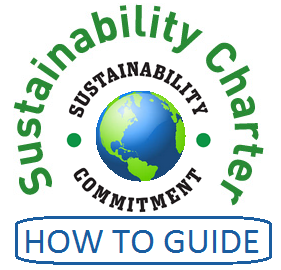 A sustainability charter is an important precursor to executing a sustainability initiative or program. A charter often serves as an organization's constitution and its contents are commonly included in the Executive Summary of a business plan. A charter spells out an organization's structure and goals. It provides a framework for identifying areas of focus, mapping strategy, making decisions, and actionable planning. A charter can include a mission, vision and values statement all of which formalize the actions and objectives of an organization. It can also outline the geographical scope and the organizational culture. A charter helps an organization to know where they are and where they want to be. It also helps them to develop strategic plans to get where they want to go. The charter should define how the organization operates, including the operating principles, functions and organizational structure. The charter should be brief ideally no more than one page. Shorter statements make better guidance tools. They are also easier to absorb and explain. Incorporating sustainability into an organization’s mission, vision or values statements informs and aligns key stakeholders with your sustainability commitment. A charter helps an organization achieve its goals by providing a framework for strategic decision making. A charter keeps the leadership focused and gives stakeholders a good understanding of what the organization is trying to accomplish and why. The reasons for crafting a sustainability-focused charter are numerous. In a for-profit business context sustainability charters have been proven to contribute to the bottom line. To start with sustainability is a boon with a number of studies showing a strong ROI on investments in sustainability. An ever-growing number of organizations are adopting sustainability making it a mainstream phenomenon and a competitive necessity. Researchers at A.T. Kearney found clear evidence that companies committed to sustainability outperformed industry averages. Both for-profit and non-profits benefit from creating a charter. A charter provides a cohesive approach to everything that your organization does. It is very useful in day to day activities as well as consistent strategic planning. It is also helpful to consistent branding and the crafting of good communications that offer a congruent message. A good charter fosters a shared vision and that involves engaging people within an organization. Charters should reflect the people in the organization so that the vision is organic. It is important to remember that a document is not a culture. People make or break a culture, so input is essential if people are to buy-in. While broad spectrum engagement is crucial, a leader should be assigned to facilitate the process. He or she should help drive the process without influencing the content. The first step is to define exactly what sustainability means in your organization. Sustainability is a very expansive term, to make it relevant it must be defined in the context of what your organization does and wants to do. What do we do as an organization? Who are we as an organization? What do we want the organization to look like in 5 and 10 years time? Where do we want the organization to be 1, 5, 10 years? What values best describe the organization? The answers to these five questions can be shared and discussed in the larger group. The best thoughts and ideas from each of the smaller groups should be documented and revised by the larger group. Revisions should be made as a function of the feedback. The final responses to each question should have strong support from participants, they should also be both descriptive and measurable. The final answers should yield the information required to craft a mission, vision and values. A Mission Statement is an organization’s present state, why they exist and what they are doing. A mission lays out goals, objectives and philosophies. The mission can also define the target audience and identify what is being offered along with a description of the geographical location in which they operate. It helps an organization to know who they are. A Vision Statement is an optimistic portrayal of what an organization wants to become. It describes an ideal future and articulates what the organization is trying to accomplish or achieve. It helps organizations choose current and future courses of action. Values Statement is a description of the basic values and principles that the organization operates by. This is a declaration about how the organization wants to value people. It also defines how people will behave with each other in the organization. The values statement summarizes an organization's top priorities and core beliefs. It helps an organization to identify with and connect to targeted groups and individuals.